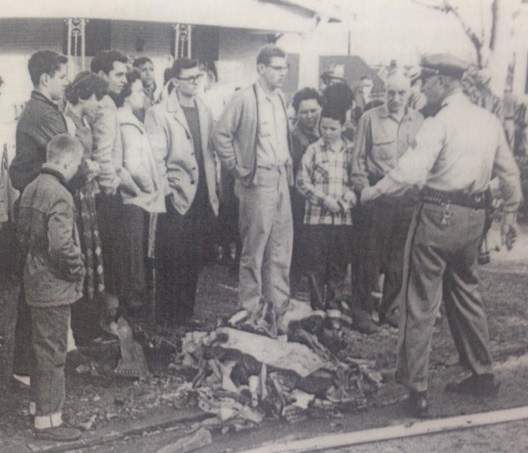 The peaceful morning of March 31, 1960, was interrupted by a horrendous noise over Hillcrest around 6:00am. A six-engine B47 from the Little Rock Air Force Base exploded mid-air. Three airmen died in the explosion and two civilians were killed when debris fell on their homes. The only survivor from the crew, 1st Lieutenant Thomas Smoak, was found dangling from a tree in his parachute at Kavanaugh and Martin. He was treated by a nurse, Jimmye Lee Holeman, in whose yard he had landed. Today, part of the crash site is part of the Arkansas Children’s Hospital campus. Other sites were removed by the I-630 construction. Other houses were rebuilt or removed. Fifty-eight years on, there are no visible scars to Little Rock’s landscape caused by the damage. This entry was posted in Government, History, LR Look Back and tagged Arkansas Children's Hospital, Arkansas Gazette, Arkansas State Capitol, Country Club of Little Rock, Hillcrest, Jimmye Lee Holeman, Little Rock Air Force Base, Little Rock Fire Department, Little Rock Police Department, Thomas Smoak by Scott. Bookmark the permalink. Alta Lois Clark was my grandmother. My sisters and I remember that tragic day. It was certainly a sad day for Little Rock. But even more so, it was a tragic day for those who were personally affected. History is not just names and dates, but actually people who mattered.